Oxidative free-radical cyclization in which the initial radical is generated oxidatively, and/or the cyclic radical is terminated oxidatively, has considerable synthetic potential, since more highly functionalized products can be prepared from simple precursors. Oxidative formation of an acyclic radical involves the formal loss of a hydrogen atom. In practical terms this is often accomplished by loss of a proton and oxidation of the resulting anion with a one-electron oxidant such as Mn(III) or Ce(IV) to generate a radical. The advantage of this method of radical formation is that the precursor is simple and usually readily available. A potential disadvantage is that the cyclization product may also be susceptible to further deprotonation and oxidation. Oxidative termination of radical cyclizations is advantageous since more highly functionalized, versatile products are produced than from reductive terminations that deliver a hydrogen atom. Starting in 1985 we have extensively developed the oxidative free-radical cyclization of unsaturated ketones, β-keto esters, β-diketones and related compounds.86,169,276 The Mn(III)-based oxidative free-radical cyclization of 1a and 1b serves to introduce the factors that need to be understood to use these reactions in synthesis. 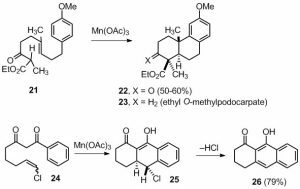 Oxidative cyclization of β-keto ester 1a with Mn(OAc)3 affords a complex mixture of products. Primary and secondary radicals, such as 5 are not oxidized by Mn(III). Heiba and Dessau found that Cu(OAc)2 oxidizes secondary radicals 350 times faster than Mn(OAc)3 does and that the two reagents can be used together. Oxidative cyclization of 1a with 2 equiv of Mn(OAc)3 and 0.1-1 equiv of Cu(OAc)2 in acetic acid affords 71% of 6a. Cu(OAc)2 reacts with radical 5a to give a Cu(III) intermediate that undergoes oxidative elimination to give 6a.86,119 A similar oxidative cyclization of 1b affords 56% of 6b as the major product. The first step in the reaction is the loss of a proton to give the Mn(III) enolate 2.276 The next step of the reaction with enolates that have a high oxidation potential involves cyclization of the unsaturated Mn(III) enolate 2 to give cyclic radical 5. This is the operative pathway for R = H. For enolates that have a lower oxidation potential, loss of Mn(II) gives the Mn-free free-radical 3. This is the operative pathway for R = Me. Cyclization of 3b from the conformation shown gives radical 5b stereo- and regiospecifically. 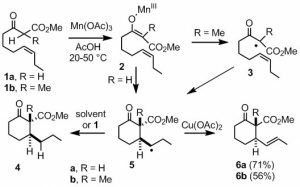 Finally, Cu(II) oxidation of 5 gives 6 regio- and stereospecifically. Oxidative cyclization of unsaturated β‑dicarbonyl compounds that have two α‑hydrogens will give products that still have one α‑hydrogen and can be oxidized further. If the product is oxidized at a rate competitive with that of the starting material, mixtures of products will be obtained. For instance, oxidative cyclization of 7 affords 36% of 8 and 10% of dienone 9 formed by further oxidation of 8.119 Competitive oxidation of the product is usually not a problem in intermolecular addition reactions because a vast excess of the oxidizable substrate, such as acetone or acetic acid, is usually used as solvent. Use of excess substrate is not possible in oxidative cyclizations. In some cases, the product is oxidized much more readily than the starting material so that none of the initial product is isolated. These reactions may still be synthetically useful if the products of further oxidation are monomeric. For instance, oxidative cyclization of 10 provides 78% of methyl salicylate (13).98,113 Oxidative cyclization gives radical 11; oxidation of 11 gives 12, probably as a mixture of double bond positional isomers. 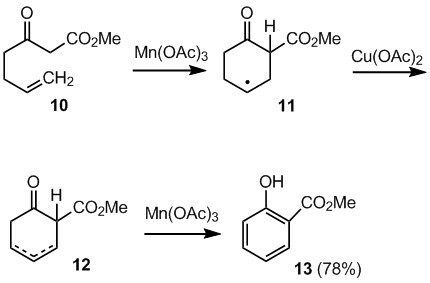 The unsaturated cyclic β‑keto ester 12 is more acidic than 11 and is rapidly oxidized further by two equivalents of Mn(III) to give a cyclohexadienone that tautomerizes to phenol 13. The overall reaction consumes 4 equiv of Mn(OAc)3. Further oxidation cannot occur if there are no acidic α‑hydrogens in the product. α‑Chloro substituents serve as protecting groups preventing further oxidation of the product.105,150 For instance, oxidative cyclization of 14 affords 82% of a 3.1:1 mixture of 15 and 16.150 The other two stereoisomers with the octyl and vinyl groups cis are not formed. This mixture was elaborated to avenaciolide (17) by a sequence that used an SN2 reaction on the α‑chloro lactone to form the second lactone ring. More complex targets can be made with excellent stereocontrol by tandem oxidative cyclizations. These reactions can be divided into two classes depending on whether the second cyclization is to an aromatic ring or to another double bond. Oxidative cyclization of 21 with 2 equivalents of Mn(OAc)3 in MeOH at 0 ºC provides 50-60% of 22 as a single stereoisomer whose structure was established by Clemmensen reduction to give ethyl O-methylpodocarpate (23).153 Tandem cyclizations can also be terminated by cyclization to an arene conjugated with a carbonyl group. Oxidative cyclization of either the E– or Z-isomer of 24 with Mn(OAc)3 in acetic acid affords 25, which undergoes slow loss of hydrogen chloride to afford 79% of the desired naphthol 26.143,147 Similar cyclizations were used for the first syntheses of okicenone and aloesaponol III.